The question "What can justify criminal punishment ?" becomes especially insistent at times, like our own, of penal crisis, when serious doubts are raised not only about the justice or efficacy of particular modes of punishment, but about the very legitimacy of the whole penal system. Recent theorizing about punishment offers a variety of answers to that question-answers that try to make plausible sense of the idea that punishment is justified as being deserved for past crimes; answers that try to identify some beneficial consequences in terms of which punishment might be justified; as well as abolitionist answers telling us that we should seek to abolish, rather than to justify, criminal punishment. This book begins with a critical survey of recent trends in penal theory, but goes on to develop an original account (based on Duff's earlier Trials and Punishments) of criminal punishment as a mode of moral communication, aimed at inducing repentance, reform, and reconciliation through reparation-an account that undercuts the traditional controversies between consequentialist and retributivist penal theories, and that shows how abolitionist concerns can properly be met by a system of communicative punishments. 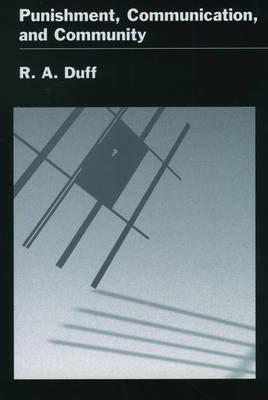 In developing this account, Duff articulates the "liberal communitarian" conception of political society (and of the role of the criminal law) on which it depends; he discusses the meaning and role of different modes of punishment, showing how they can constitute appropriate modes of moral communication between political community and its citizens; and he identifies the essential preconditions for the justice of punishment as thus conceived-preconditions whose non-satisfaction makes our own system of criminal punishment morally problematic. Punishment, Communication, and Community offers no easy answers, but provides a rich and ambitious ideal of what criminal punishment could be-an ideal of what criminal punishment cold be-and ideal that challenges existing penal theories as well as our existing penal theories as well as our existing penal practices.